by Glen E. Miller. Herald Press, 2014. Dr. Glen Miller, a retired physician, invites readers into a “conversation about end-of-life questions and the spirituality of dying as he explores a variety of beliefs about death and dying.” The book resulted from his own “wake-up call when he suffered a heart attack” and “the need to plan for my own good death in view of my shortened life expectancy.” This extraordinary personal reflection has both scientific and spiritual perspectives, incorporating wisdom from his work with Mother Teresa among the dying of Calcutta, India. 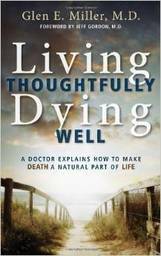 Congregations and individuals can find this to be a helpful guide in considering how to live more fully and plan more proactively for death.